Research: "The Influence of Scientific Knowledge on Extended Flute Techniques and their Execution"
In this research paper, my goal was to submerge myself in the world of contemporary or extended techniques on the flute. I love to play contemporary music and execute these techniques, because we learn to go so much further in our flute playing then we ever imagined, by adding this pallet of new sounds. Contemporary music and extended techniques can teach us to go much further in our performances and thus also influences the way we play the standard flute repertoire. 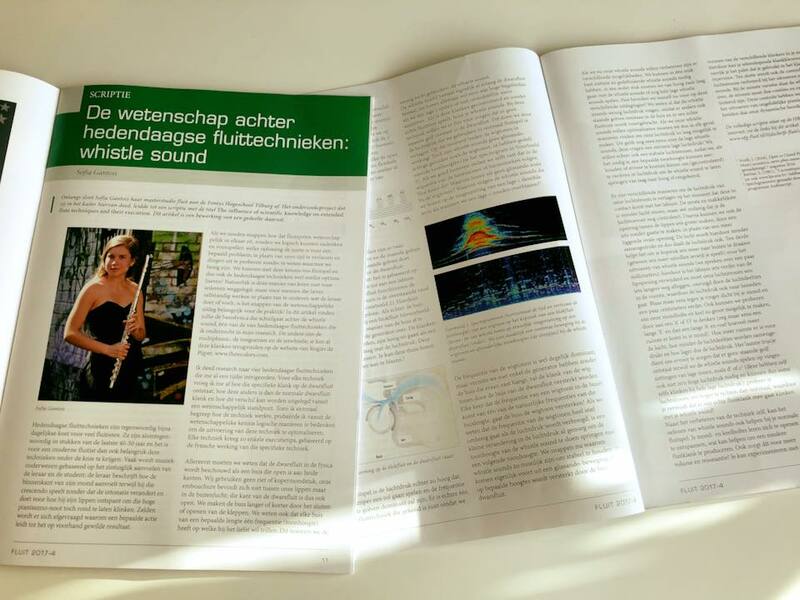 This research paper was written to obtain my Master of Music at Fontys School of Art and got published in the "HBO Kennisbank", so for those who are interested to read it completly, you can find it by clicking on the button below. FLUIT magazine published a part of my research, in the form of an article they asked me to write and I recently heard my paper was selected for the national research competition of Fontys (of which the results are still unknown). I noticed that teaching and learning extended techniques is very hard. In my eyes this is because we approach these techniques in a purely sensory-based way, our teachers try to describe what they feel and do whilst performing these techniques and then ask you to search for the same sounding result. Phrases such as “maybe you can try this” or “wait, let me see how I do that” are very commonly heard when learning contemporary techniques. There is no real thinking involved, just feeling and listening. In instrumental studies and teaching we often learn through these sensory-based methods, but for the study of extended techniques this did not strike me as enough. 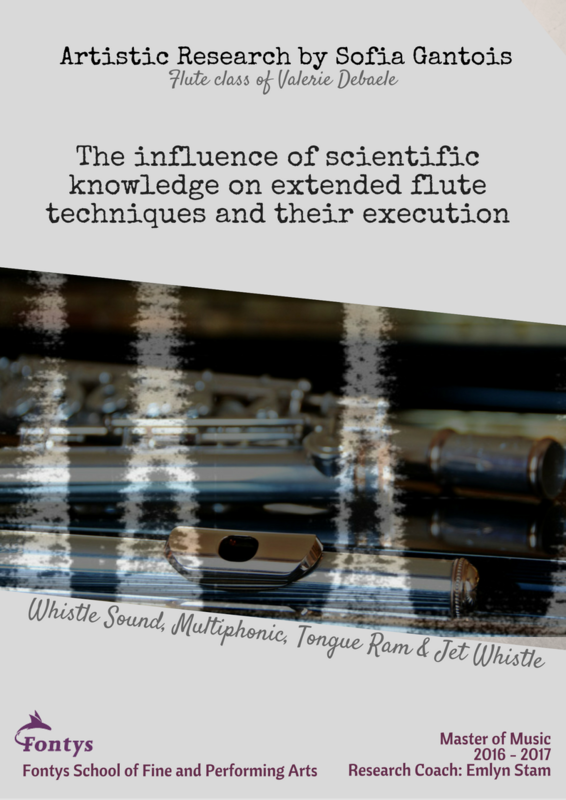 I was able to learn them, but I felt that having more information on how these sounds are conceived, how they are scientifically possible and explainable, would lead to more efficient learning, for me and for other flute players. How is the specific sound conceived? In what way is the sound different from normal flute playing? How can I explain the difference in sound, compared to normal flute playing, from an acoustical point of view? Now that I understand how this technique works, what can I do to optimise its execution? How can training this technique help advancing in normal flute playing, in repertoire without extended techniques? These techniques can be used in different styles of contemporary music, but the style of music doesn’t influence the execution or end result of the technique. There is no absolute right way of doing them, but there are uniform standards for the sounding result. The standards are individually defined for each technique and I will talk about this more thoroughly in each chapter. Of course we must not forget that the composer or performer maybe wants the extended technique to sound differently than “expected”, but even then it is good to be able to play the technique as it “should” sound, so the performer can consciously transform it. I put together a set of best practices or tips for executing these techniques based on scientific information. I finish my research with a case study of a contemporary piece I played last year. All four techniques I investigated are in it and I had a regular contact with the composer, Edgar Guzman, who gave me 2 recordings by 2 different flute players. In the case study, I compare the execution of the techniques on the recordings and try to explain why they sound differently. The differences can of course be individual choices and I do not judge the correctness of the execution, I just state what I hear and analyse the differences.